"I mustn't give up… I made a promise…!" GKids has unveiled an official US trailer for the Japanese anime Mary and the Witch's Flower, made by Studio Ponoc. This film already opened in Japan in July, and we featured the Japanese trailers leading up to that release. Studio Ponoc is the spiritual successor to Studio Ghibli started by a bunch of former Ghibli animators. Their first film tells the story of a girl who discovers a broomstick and goes to a witches school only to learn that the animals are being kept in cages. Directed by Hiromasa Yonebayashi, with music by Takatsugu Muramatsu, based on "The Little Broomstick". This trailer features English language voices, since it will be released for one night in theaters dubbed in English. Check it out below if you're still interested. The English language version features the voice talents of Ruby Barnhill (from Spielberg's The BFG), Kate Winslet, and Jim Broadbent. Still looks wonderful to me. You can see the original teaser trailer for Mary and the Witch's Flower here, or the second / third trailers. It is Tib the black cat who leads Mary to the strange flower in the woods. When she discovers a broomstick shortly afterwards, she is astonished to feel it jump in to action. Before she can gather her wits, it is whisking her over the treetops, above the clouds, and in to the grounds of Endor College, where: 'All Examinations Coached for by A Competent Staff of Fully-Qualified Witches.' Here she discovers evidence of a terrible experiment in transformation - deformed and mutant animals imprisoned in cages. In the moment after her broomstick takes off, she realises that Tib has been captured. 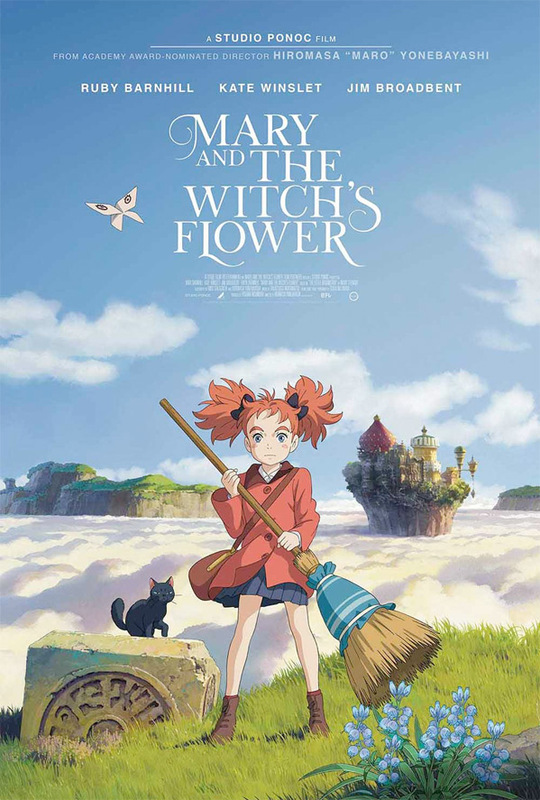 Mary and the Witch's Flower (or Meari to majo no hana in Japanese) is directed by filmmaker Hiromasa Yonebayashi, of The Secret World of Arrietty and When Marnie Was There. It's based on the book "The Little Broomstick" by Mary Stewart. The film already opened in Japan in July earlier this year. GKids will release the US version of Mary and the Witch's Flower for one night on January 18th, 2018. For more info visit Fathom Events.